The Sun trots out all the usual suspects to talk about the current push to get Translink extended beyond Metro Vancouver (“Pemberton to Chilliwack”). It actually is a pretty daft idea right now, given that Translink cannot balance its books and is threatening to hike fares and cut service if it cannot get a new funding source. So of course the surrounding communities are quite right to be concerned about why this is being pushed right now. It looks like a tax grab – for Squamish and the Valley to pay for transit in Vancouver. The context has to be that Surrey is still very badly served – and has a transit mode share of 4%. Which like all sounds bites is only partly true. The use of the word “efficient” is odd too – efficient for whom? The transit system – such as it is – came after the development. The land use pattern was typical North American suburbia – single land uses, widely separated, with lots of space for cars to move and park. In fact the whole thing was designed with cars in mind – not people. The underlying assumption of the transportation engineers and land use planners was that everyone who mattered would drive everywhere. This pattern and preconception is being repeated, despite the fact that we know it is not sustainable – even in the short term. And the plans of the province to widen the major freeway within Metro simply reinforce that. The so called transit plan is to do a lot less, a lot later. By which time everyone will be stuck in a pattern that is hard to change. Transit must precede development. Retrofitting car oriented suburbs is difficult, expensive and often less effective. Of course it is true that much of Vancouver, Burnaby and New Westminster grew up around the streetcar in a dense walkable pattern. But equally much of the outer areas grew up around the interurban and railway stations. It just that there has been a lot more development in recent years, when we were enjoying cheap energy and built as though there was no tomorrow. We need more transit oriented development (TOD)- the only kind that is going to be viable soon – and we cannot get that without the transit service. My bet would be that if passenger service is reintroduced on the old BCER tracks there will be a lot of interest in doing TOD around the stations – and recreating the walkable urban centres we used to enjoy before the spread of the “plaza” and the “power centre”. The old Interurban runs north south through Abbotsford. That’s nothing to do with milk but everything to do with geography – and the fact that the line was built before Sumas Lake was drained. Light rail is not “very expensive” if you have existing tracks and you want to use what you have and plan accordingly. But Abbotsford’s plan is now to build transit along South Fraser Way and try to get redevelopment onto the parking lots to turn the “corridor” into a real urban street. This is far sighted – and much less “expensive” than watching the whole lot become a wasteland, when the cost of fuel leaps again and people simply cannot afford to drive so much. What could “happen overnight” is the conversion of the curb lanes to exclusive bus lanes. A number of cities have done this as a way to make the bus more attractive – and add additional features over time to spread the cost and help build the ridership towards one that will support rail. How successful that is depends very much on the developers’ confidence that the bus service will indeed persist and improve. It is not an easy sell, especially when transit systems across North America – facing exactly the same challenge that Translink does – are cutting service and raising fares to balance their books in the face of rising demand. Investing in tram tracks looks like a real commitment to a new system in a way that diamond lanes don’t. Getting some passenger service onto the interurban need not be very expensive. 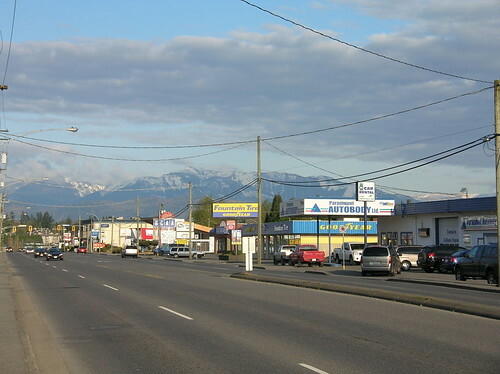 It would not be ideal in Abbotsford perhaps – though it seems to me that the rail corridor through town is in need of a stimulus – but in other parts of the Valley it would serve most of the post secondary educational institutions rather well. The reason it could be relatively inexpensive is that the right of way – and the right to run passenger trains – still belongs to the Province. And the Washington Group who own the tracks and run an occasional short freight train – are not averse to a deal. As usual, the best is the enemy of the good. Possibly the least likely scenario is the one espoused by Kevin Falcon who talks about SkyTrain reaching Langley by 2030. Not only is that just not good enough to deal with present challenges but it is also nowhere near likely to get outlying communities to sign on to his expansionary plans for Translink. Chilliwack has probably had the right idea all along. Stay clear of suburban sprawl and concentrate on being as self contained as possible. Most people who live there work there too. There is not much inter-city commuting to or from Chilliwack. It is still almost completely car dependent, and its transit system is quite appalling. But that is the choice the voters there made. By “improving” the Sea to Sky, that choice has been lost to Squamish. The developers who pushed for this in the name of the Olympics will take a bit longer to get there huge returns – but it will still happen, becuase there are plenty of people who can still be suckered into long driving commutes. Becuase that is what has been happening for the last 60 years and people still do not seem to have understood that is the problem.